I thought that the figures of Justice and Mary Winchester absolutely matched each other. They both do what has to be done and they’re stretched out towards the truth for the parts. 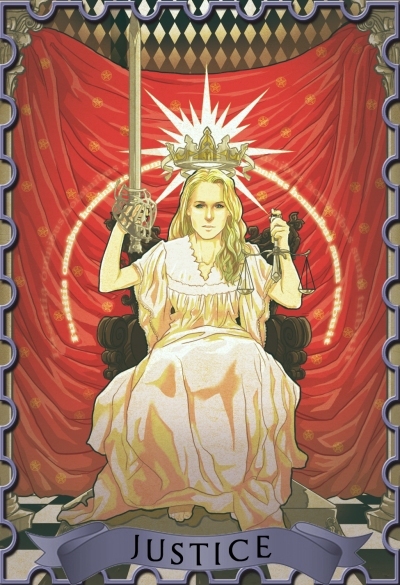 Mary is a positive figure that adapts herself to a card that has to represent stability and integrity. I opted not to blindfold her (as Justice is at time represented) because I wanted to show her calm and determined stare, as her decisions are. I tried to use the classic nightgown, the one that we all know (sigh), readapting it a bit. Maybe I should have made it a bit more masculine, without the frills, maybe some kind of an armor on her frame…but I don’t think that having a ‘sweet’ dress clashes too much with being irreproachable. I kept a very classic vision of the card in order not to make her lose elegance and, yes, severity. The writing behind her shoulders is in Latin: “Iustitia omnibus hominibus suum tribuit”, that means “Justice gives to each man their own”.